Breakfast at the hotel gave me and Bela a chance to send out some good karma. When we got to the breakfast area, there was a lady putting a couple of plates together for family members who did not want to come downstairs. As I fixed my own plate, the lady (Janice) and I started chatting. Janice said her family members wanted waffles, but that was too bad since she wasn’t sure how to run the waffle iron. I showed her, and she got her waffle. By this time, Bela had emerged from our room and was in the process of fixing her own plate. Bela and Janice started talking—Bela was “schooling” her about Comic Con and her costume. Janice asked if Bela could help her carry plates to her room, and off they went. Before Bela came back, another lady with her grandchild (I’m guessing….) came for food. Oddly enough, she wasn’t sure how to manage making waffles. I smiled because Bela had to show me at another hotel years ago. 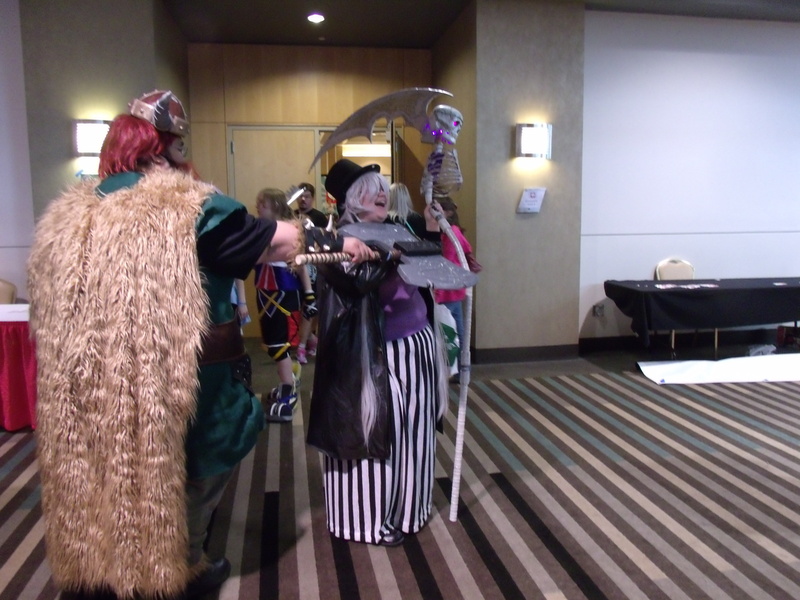 Janice wanted to see Bela’s Black Butler Undertaker costume, so they met up in the lobby before we left for the Mid-America Center. Before we actually left, I spoke to one of the housekeepers who was getting ready to clean rooms. I greeted her in English, then said, “Buenos dias?” She answered in Spanish, so I explained in Spanish that we needed more towels and shampoo and the trash taken out. I didn’t want the beds made or anything else done. She said she would pass that along to her fellow housekeeper who was assigned our room. The hotel clerk passed us in the hall while we were chatting and commented, “That is so cool.” I was thrilled to be able to use my language skills. Imagine my surprise when I was able to use ASL as well on this trip! More about that later.